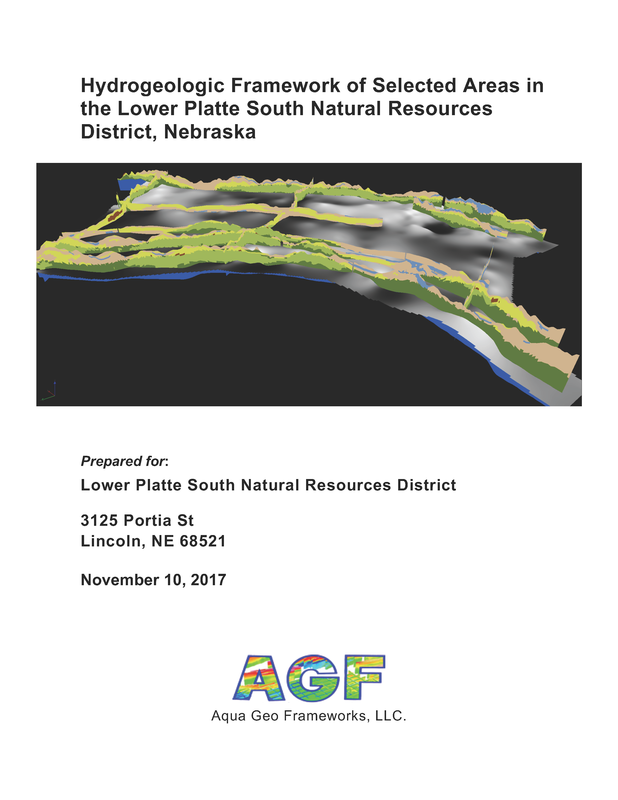 Several Natural Resources Districts (NRDs) across the state conducted AEM flights in July and early August 2016 using Water Sustainability Fund (WSF) grant dollars awarded in April 2016 ("https://nrc.nebraska.gov/water-sustainability-fund-0"). 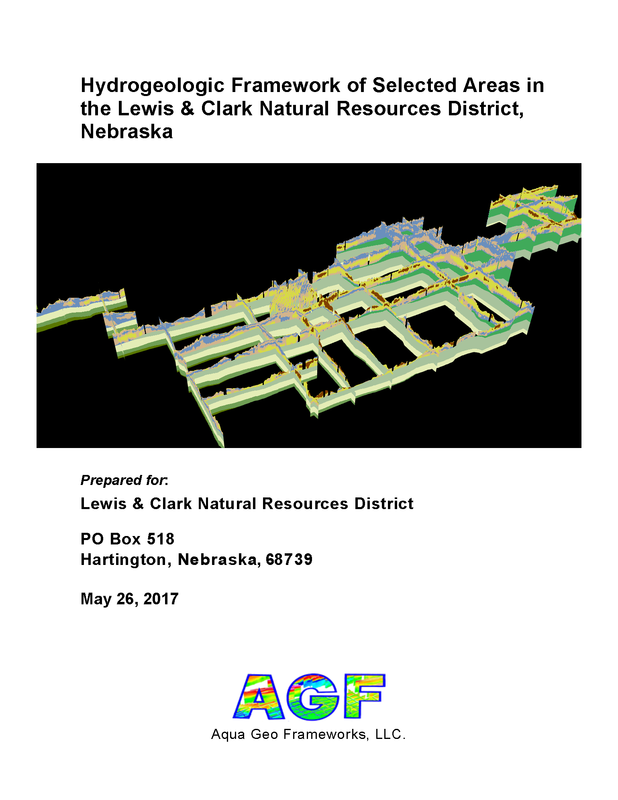 Click here for a link to download the 2007-2016 Existing Areas Flown using AEM survey in Eastern Nebraska in Google Earth Format (1.71 MB, areas depicted may not be all inclusive). The interpreted results for the 2016 AEM flights have been provided in Google Earth format. You can download the free version of Google Earth Pro by clicking here. Click here for a link to download the Google Earth datasets (.kmz file and associated image files, 80.5 MB) from ENWRA's Dropbox. You can select "no thanks" to the sign-up for a Dropbox account and still download the files. You must have Google Earth installed on your computer before downloading or opening the .kmz Google Earth dataset files. If you already have a Dropbox account, please choose direct download to your computer so you do not fill up space on your personal Dropbox. Please follow the instructions in the "GoogleE_README.pdf" PDF file on Dropbox here AND save the downloaded files with the same exact file structure as shown on the Dropbox. 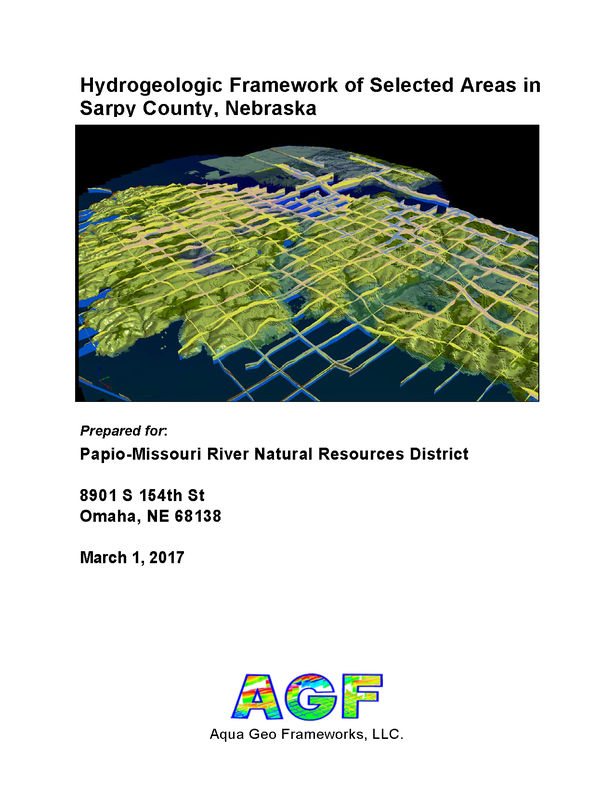 Google Earth will look here on your hard drive: C:\Sarpy_Profiles\ for every profile image when you touch a link on a data dot - see example image below. The easiest way is to do this is to create a folder named "Sarpy_Profiles" directly on your C drive and then save all the downloaded dropbox files to that folder. Google Earth Tips and Tricks: Grab the map with your cursor and hold down the "u" key on your keyboard to view the earth looking straight down instead of at an angle. Do the same and hit the "n" key to orient the map north as up. Google Earth Pro (link above) is free and you can hit the file menu, then hit open, and then select all data import formats from the dropdown and open an ESRI shapefile or many other GIS file types in Google Earth directly from a saved location on your computer. The interpreted results for the 2016 AEM flights have been provided in Google Earth format. You can download the free version of Google Earth Pro by clicking here. Click here for a link to download the Google Earth datasets (.kmz file and 58 associated image files, 31 MB) from ENWRA's Dropbox. You can select "no thanks" to the sign-up for a Dropbox account and still download the files (upper right, download button). 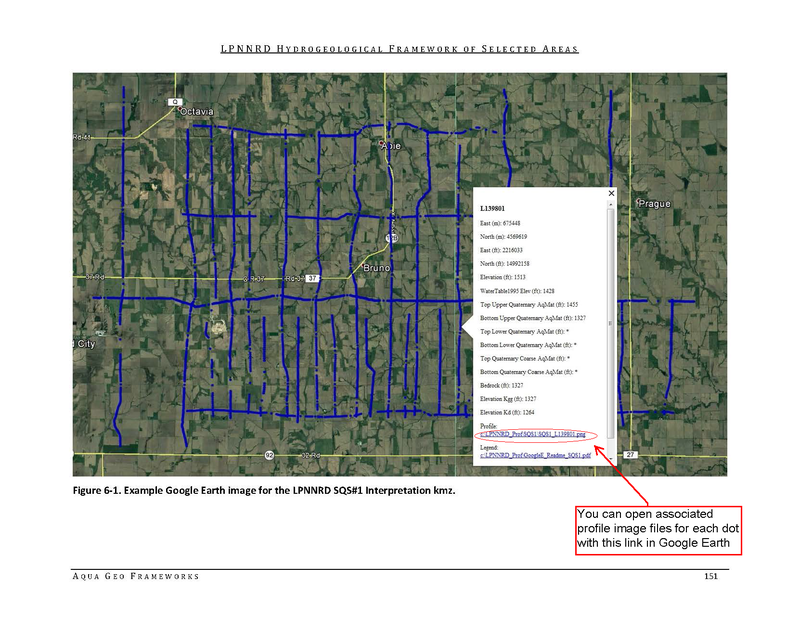 You must have Google Earth installed on your computer before downloading or opening the .kmz Google Earth dataset files. Please follow the instructions in the "GoogleE_README.pdf" PDF file on Dropbox here AND save the downloaded files with the same exact file structure as shown on the Dropbox. Google Earth will look here on your hard drive: C:\LCNRD_Prof\ for every profile image when you touch a link on a data dot - see example image below. An easy way is to do this is to create a folder named "LCNRD_Prof" directly on your C drive, download and unzip the Dropbox files wherever your browser typically puts downloaded files, and then save all the downloaded, unzipped files to that LCNRD_Prof folder. 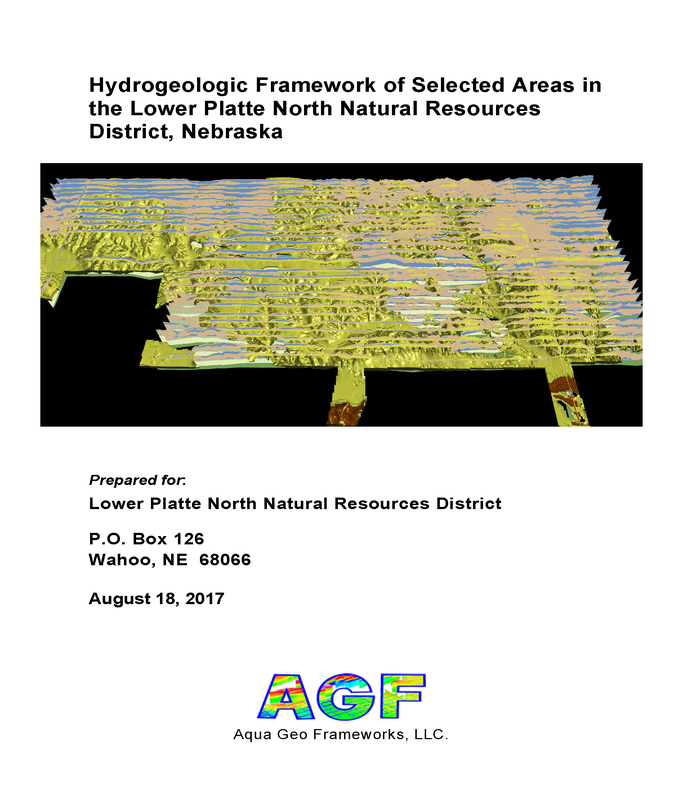 The interpreted results for the 2016 AEM flights have been provided in Google Earth format. You can download the free version of Google Earth Pro by clicking here. 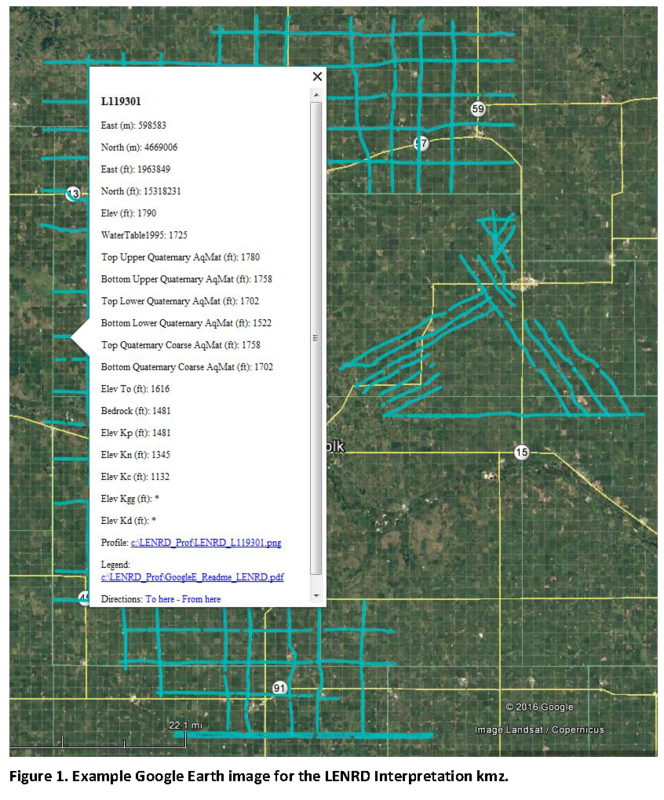 Click here for a link to download the Google Earth datasets (.kmz file and 128 associated image files, 74 MB) from ENWRA's Dropbox. You can select "no thanks" to the sign-up for a Dropbox account and still download the files (upper right, download button). You must have Google Earth installed on your computer before downloading or opening the .kmz Google Earth dataset files. Please follow the instructions in the "GoogleE_README_LENRD.pdf" PDF file on Dropbox here AND save the downloaded files with the same exact file structure as shown on the Dropbox. Google Earth will look here on your hard drive: C:\LENRD_Prof\ for every profile image when you touch a link on a data dot - see example image below. An easy way is to do this is to create a folder named "LENRD_Prof" directly on your C drive, download and unzip the Dropbox files wherever your browser typically puts downloaded files, and then save all the downloaded, unzipped files to that LENRD_Prof folder. 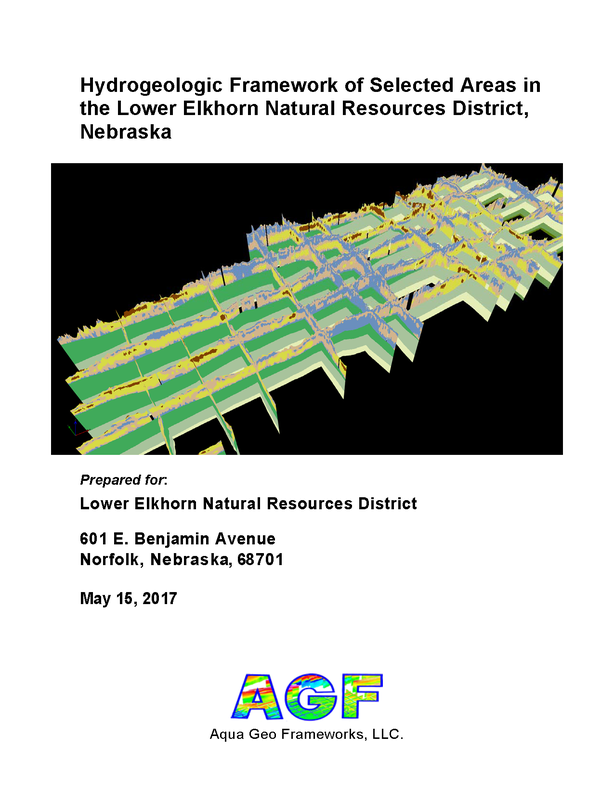 The interpreted results for the 2016 AEM flights have been provided in Google Earth format. You can download the free version of Google Earth Pro by clicking here. Click here for a link to download the Google Earth datasets (two ".kmz" files and 96 associated image files, 30 for SQS1 and 66 for SQS2, totalling 132 MB) from ENWRA's Dropbox. You can select "no thanks" to the sign-up for a Dropbox account and still download the files (upper right, download button). You must have Google Earth installed on your computer before downloading or opening the ".kmz" Google Earth dataset files. Please follow the instructions in the "GoogleE_README_SQS1.pdf" PDF file on Dropbox here and "GoogleE_README_SQS2.pdf" PDF file on Dropbox here. Save the downloaded files with the same exact file structure as shown on the Dropbox. Google Earth will look here on your hard drive: C:\LPNNRD_Prof\ for every profile image when you touch a link on a data dot - see example image below. An easy way is to do this is to create a folder named "LPNNRD_Prof" directly on your C drive, download and unzip the Dropbox files wherever your browser typically puts downloaded files, and then save all the downloaded, unzipped files to that LPNNRD_Prof folder. The interpreted results for the 2016 AEM flights have been provided in Google Earth format. You can download the free version of Google Earth Pro by clicking here. 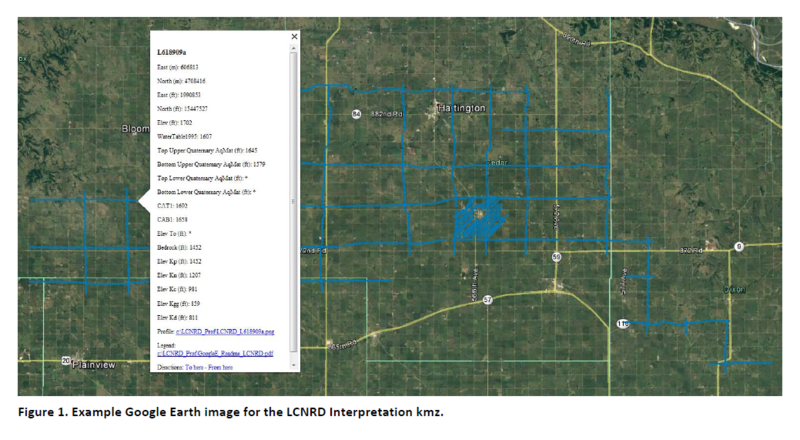 Click here for a link to download the LPSNRD Google Earth datasets (207 MB: one ".kmz" file and 164 images) from ENWRA's Dropbox. You can select "no thanks" to the sign-up for a Dropbox account and still download the files. You must have Google Earth installed on your computer before downloading or opening the .kmz Google Earth dataset files. Please follow the instructions in the GoogleE_README.pdf legend file on Dropbox here AND save the downloaded files with the same exact file structure as shown on the Dropbox. 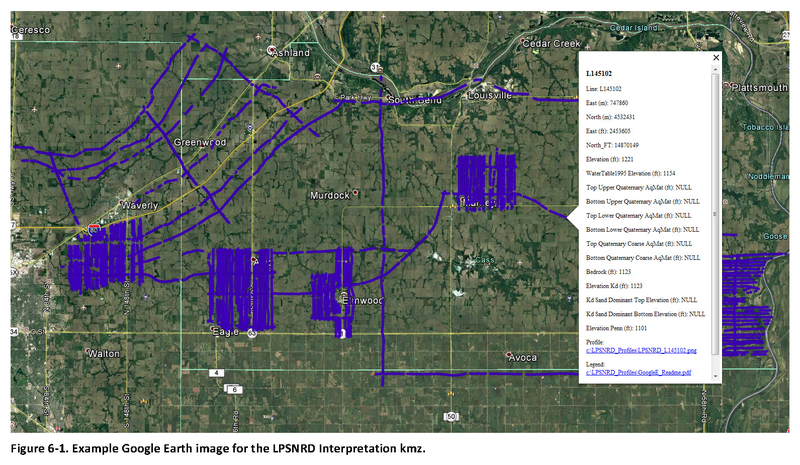 Google Earth will look here on your hard drive: C:\LPSNRD_Profiles\ for every profile image when you touch a link on a data dot in Google Earth - see example image below. The files on your C drive must all be unzipped in order to work from Google Earth. For example: you can create a folder called "LPSNRD_Profiles" directly on your C drive, unzip the files wherever your browser typically saves downloaded files, and then save the unzipped downloaded files to that "LPSNRD_Profiles" folder on your C.